Get Rich Click! Review | Affiliate Marketing How-To Or How Not To? 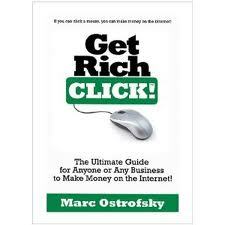 Enter Mark Ostrofsky, a leader in affiliate marketing who attempts to break away from the crowd of internet moneymaking “how-to’s” to deliver a product with real substance with Get Rich Click! 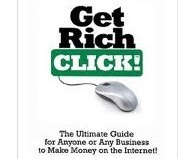 his guide on how to make money on the internet. Carving out a place among the countless internet “how-to’s” that promise overnight success is a feat in itself. Earning money online through e-commerce, pay-per-click advertising, e-publishing, affiliate marketing and creative domain management is generally considered an area of expertise that beckons many but rewards few. As CEO of ClickBank, a highly successful online digital retailer, Ostrofsky is one of the few who actually has the professional experience to share pertinent and meaningful data – and he does. The subject matter he delivers is covered by thousands of professional bloggers, authors, consultants and industry professionals every day, yet he manages to distinguish this book as a genuine industry resource tool via a “just the facts” approach. An organized outline for each chapter includes research, opportunity, case studies and a suggested plan of action that results in a value-added product for would-be online entrepreneurs. By providing direction, real tools and tips throughout, there is something here for everyone looking to become either comfortable or proficient at making money in the digital world. Although he wanders into some areas of expertise not exactly his forte, specifically search engine optimization, he recognizes the importance of it and includes a clever workaround, dedicating an entire chapter to a website that is the industry standard for best practices in this critical area. Lending confirmation to the author’s genuine objective to teach is a huge bonus in the form of an exhaustive list of hundreds of resources and site links to proven leaders in several key areas, along with a number of lesser-known but highly relevant sources to explore. This is an easy read, with a direct but relaxed tone and a passion for what he does that comes through loud and clear. If the benchmark for success in a how-to is whether or not there is a concrete take away, this one is a winner for anyone with real interest in making money on the internet.